Summary Crowd-sourced cloud storage and sync service that lets you share your excess local storage in exchange for free cloud storage. Whether you’re protecting corporate data or protecting those valuable personal files stored on your computer at home, offsite storage is a critical component for disaster-proofing your data. With all of the services offering cloud storage, you no longer have to worry about remembering to backup your data to removable media and taking it offsite for safe keeping. You can merely subscribe to a service, install their software, and your data is automatically backed up to the cloud. Though most services provide a teaser amount of free storage to allow you to try out their service, all of them offer (push) an upgrade path for you to store more data than the relatively modest amount included in your free account. I compiled a chart (Figure 1) of a few vendors, showing some of cloud storage pricing models that you’ll encounter. The chart is not intended to be comprehensive, nor does it assign any value to the various differentiating features that each service provides. Other reviews we've done have covered most of the features. What the chart does show is the range of cost per gigabyte per year for offsite storage. Excluding the free teaser storage, the costs range from $0.30/GB/Yr to $2.00/GB/Yr. What if you could get virtually unlimited storage for free? Well, then you’d be talking about Symform. You’re probably wondering how they can do that, especially the free part. 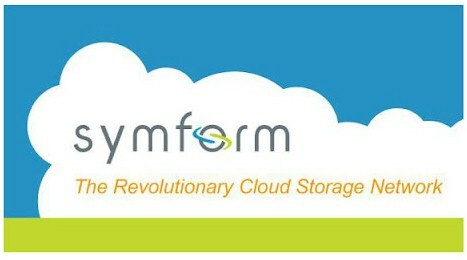 The answer is that Symform takes a unique approach to cloud storage. They assume, and rightly so, that virtually everyone has excess storage capacity and 24/7 “always on” internet connections with decent bandwidth. Symform uses a patented encryption and data redundancy architecture to securely distribute “fragments” of your data along with parity information to storage contributed by other members of Symform. Symform’s pricing is very simple. First, you get 10 GB free as your signup incentive. Thereafter, you can either purchase additional storage for $0.15/GB/Month, or your can get your cloud storage for free if you contribute some of your excess storage to the community. Excess committed storage can also be used for optional support plans. For every 2 GB of storage that you make available to Symform, you get 1 GB of cloud storage for free. Of course, it’s not really free, since you are providing storage capacity via an always on device and bandwidth in exchange for “free” cloud storage. But if you cover your cloud storage needs with bytes instead of bucks and have some spare bandwidth, you don’t have to write a check to Symform each month. Symform is basically a folder synchronization product. You can only select folders that you want to synchronize with the cloud. You don’t have choices of selecting individual files or file types for backup. You select a folder, and all subfolders in that tree are included. Symform next encrypts the data and chops it up into fragments. The ideal size for a folder is 64 MB and that block of data is broken into 64 1 MB fragments. To that data, 32 parity fragments are added and all 96 fragments are distributed to 96 member devices (contribution nodes) out in the cloud. The algorithm for adding parity is actually a RAID algorithm. If you’re familiar with RAID storage, you could, as Symform says on their website, think of this as RAID 96. Cloud Control metadata is sent to Symform’s redundant secure data centers where Symform keeps track of where each fragment is sent. Of course, as with all RAID systems, the parity required for redundancy adds overhead. In the best case with the optimal folder size, there’s a 50% overhead. So for each 1 GB of data on your computer that you are protecting, you’re sending at least 1.5 GB to the cloud. Smaller blocks of data can significantly increase the parity overhead. However, you are charged based on the local folder size, not the additional cloud storage size that results from padding and parity. You can check this more detailed discussion of how Symform works or watch a short demo video. Since there’s data redundancy spread throughout the cloud, more than 32 of the “right” member host devices would have to be unavailable for you to be unable to recover your data. Symform constantly monitors the performance and availability of contribution nodes. If a member’s device becomes unavailable, Symform will send an email notifying them, and can recreate the data from the unavailable device (from other data and parity) to send to another contribution node. Data is geographically dispersed. A natural disaster that might impact a region of a country is statistically unlikely to impact your data availability. According to Symform, member contribution nodes are located in 150 countries. Your computer streams encrypted fragments (with parity) directly to each of the hosts’ devices. It’s much like BitTorrent, which uses parallel data streams coming from multiple peer-to-peer endpoints. This improves performance and eliminates bottlenecks. Your data is absolutely secure. While some people might worry about their data being stored on other members’ computers, the architecture ensures security. All data is first encrypted using 256 bit AES. Then it is broken into 64 fragments and then parity added. Finally your fragments are scattered to at least 96 contribution nodes. Contribution nodes are essentially repositories for bytes of data that are fragments of encrypted files. The real world analogy would be to shred your paper documents in a cross-cut paper shredder, and deposit the shredded paper into 96 different dumpsters. Figure 2, courtesy of Symform, shows their storage architecture.